Simple, potent icons to illuminate almost any situation. Go where words alone cannot. Symbols evoke profound emotions and memories, often without our making rational or conscious connections. They surround us and they help navigate through life, providing short cuts to understandings, ideas and feelings. In a therapeutic relationship, the use of visual images can assist a client to get in touch with otherwise inaccessible personal realities. Symbols is a set of cards featuring 100 hand-drawn, iconic images that have resonance for people grappling with the big questions in life. Some of the symbols evoke difficulties and challenges (Knot, Hourglass, Question Mark, Gravestone). Others bring to mind possibilities, hopes and achievement (Trophy, Balloon, Rainbow, Bridge). Some of the symbols transcend cultures; some might feel very familiar to you, others less so. Choose a card at random. What does this symbol mean to you? What words come to mind? Does this symbol conjure any particular memories? Use the cards to explore group dynamics and identity. Does the symbol have different meanings for different group members? How to members react emotionally to each symbol? What does this reveal about similarities or differences between group members? Choose a card that interests you or select one at random. What does the symbol mean to you? Does it suggest a story you might like to write? Who could you imagine reading your story? Which Symbols card or cards helps you define or describe your understanding of spirituality? Is there a card that represents mystery? Are there any cards you could draw on to broaden spiritual possibilities? Which cards say something about your pet likes and dislikes? Which symbols do you imagine another person would choose to describe you? Is there a symbol that sums up your relationship with a significant person in your life? Originally developed as a tool for grief and loss counselling, Symbols is a highly versatile card set, ideal for use in teaching, creative arts therapy, family counselling and many other fields. Beautiful in their simplicity, the Symbols cards make great prompts for public-speaking, storytelling, icebreakers, mind-mapping and interviewing. 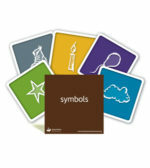 ‘I recently bought the Symbols and Words cards. I have used them in a grief and loss group, and in individual counselling sessions. They have all been spectacularly helpful and useful tools. My clients report that they initially thought ‘How can this help?’ But once they chose a word or symbol (or two or three) away the session went. ‘I would like to tell you how much the family carer support group that I facilitate enjoys working with both the Symbols and Words cards. These family carers usually care for a partner or a parent with dementia. As you can appreciate the road is difficult and long, with no end in sight. Some family carers accept and perform their caring role so gracefully, but for some it is almost too much to bear, and to talk about the pain, frustration, guilt and anger is so hard. Young carers are huge assets in our community. In the T.I.M.E. Out Sibling Program at Melbourne City Mission, high school kids who have a brother or sister with a disability often don’t often recognise that they are in fact ‘young carers’. By introducing St Lukes’ materials throughout team games, art projects, competitions and deep conversations we make links between what young people do for their siblings at home, their special skills and talents, their important place in the world, and their huge potential to make a difference in work and society in the future. 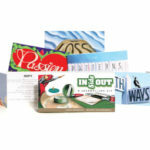 Find a Symbol card that is about your role in your family, we ask. Tell us about the symbol. Why did it jump out? What does it mean for you? What do you call your role? Who else knows about it? When are you not like that? The responses are many and varied: ‘swords’ for the defenders and advocates… ‘rainbows’ and ‘candles’ for the peacemakers and hope-givers… ’helping hands’ and ‘springs’ of energy for the young carers looking after siblings and giving mum and dad a break. 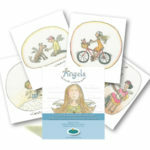 The Symbols cards make it is easy to respond to such choices in ways that empower and build self-esteem in the participants: Wow, what a lot of talent… How amazing you are doing this on top of school and all the normal stuff at your age… How lucky are we to have such great young carers in our world! And resources that help young carers recognise and acknowledge the hard stuff, the growth and the positives in their journeys. It was one of those spontaneous moments when I found myself having to take a seminar at short notice. The topic was Narrative Therapy and the resource that came to hand was Symbols. With the contents of the neat little tin spread across a table, I invited the students to choose two cards each. The aim of the exercise was to demonstrate ‘thin’ and ‘thick’ narratives (or accounts) and the importance of searching for ‘thick’ or rich narratives in this therapeutic approach. ‘Thin’ narratives are those that give little depth of information and tend to result in the most obvious, but often incorrect, assumptions. For instance, if a woman were to say she was feeling low in the mood and couldn’t sleep, one might assume—without sufficient evidence—she was depressed. ‘Thick’ narratives are needed to develop a depth of understanding and to assist in drawing more accurate conclusions. The woman in this example might be encouraged to tell more of her story revealing her struggle with allergic hay fever and the difficulty of getting effective medication. In the seminar I facilitated, the students worked in pairs giving a brief account of why they had chosen their two symbols. The accounts were typically ‘thin’ in the first instance. However, after some discussion of the importance of eliciting ‘thick’ accounts in Narrative Therapy we returned to the cards. Now each student helped their partner to develop a more rich account of the symbols they had chosen. During the feedback session it became evident the discussion had, indeed, become much more rich and Symbols had been an ideal choice! ‘I recently bought the Words and Symbols cards. I have used them in a grief and loss group, and in individual counselling sessions. They have all been spectacularly helpful and useful tools. My clients report that they initially thought ‘How can this help?’, but once they chose a word or symbol (or two or three), away the session went. It has helped people to verbalise feelings and thoughts that they might never have known were there. A disability worker selected several Symbols cards to help prepare her client, Sarah, to attend her father’s funeral. The cards Sarah chose were: coffin, tear drop, heart, candle, flower, cross, gravestone, hands praying, and book. Using each of these Symbols cards the worker was able to speak with Sarah about the various possible images and symbols she might see at her father’s funeral. The worker and Sarah had three separate conversations over a few days which helped Sarah prepare for, and better understand, what she might experience. Sarah was also invited to draw her own feelings and thoughts about her dad’s death and funeral, using her own symbolism. The Innovative Resources tools I have introduced in Japan have been embraced with enthusiasm and at times delicate poignancy by workshop participants. As an educator working with non-English speaking groups of between 32 and 75 participants the diversity of these products makes them a greatly valued resource. At a recent workshop participants included palliative care, generalist, disability and midwifery nurses; doctors, including palliative care specialists; pastoral care staff, psychologists, occupational and speech therapists; social workers, Master’s students, pharmacists and nurse educators. The group’s diversity not only added to the learning environment but also provided validation—from a rich mix of domains—for the thoughts and feelings experienced by individual participants. Such feedback affirms the need for this type of education and training in Japan. Like many places, health and welfare professionals here often overlook and under-value the setting aside of time for deep reflection upon their experiences. Despite this, I have successfully introduced The Bears, both sets of Strength Cards (translated into Japanese in 2004), Koala Company (a great and joyful hit! ), Signposts (despite the English), Shadows, and most recently, Symbols into my workshops. I spread the Symbols cards around and wondered how things would develop as participants were invited to scan, choose a card and then share in pairs and groups of four. It worked! The connections and engagement, mood and tone that developed as participants held one or more of the Symbols cards were very evident. At times the room was a-buzz with lively chat and at other times more subdued and genteel. My most sincere thanks to St Luke’s Innovative Resources and my translator! Brian and Jill both agreed that they needed to see someone. Their 30-year marriage had had plenty of ups and downs but with their children gone their expectation about being contented ‘empty nesters’ just wasn’t happening. Each chose about six cards. The only card they had in common was the symbol of a dog. This was an initial surprise but as they talked, it seemed to make sense. Their long-time pet dog, Buster, had disappeared some six months ago. They had never heard what had happened and while they were resigned to not seeing Buster again they had never talked about their feelings or about getting another dog. Buster had really been Jill’s dog as she was around the house more and did all the feeding. For Jill, Buster had been a companion; he helped her fill the empty nest and feel safe. For Brian, the walks at weekends had provided exercise and a way of letting off steam from his job. Both were acutely missing Buster. Selecting the same card highlighted their shared experience and opened up a starting point for connecting emotionally once again.